Over the years I have created a number of unique tools and sites. The following is a collection of some of those tools and sites. I have become very interested in the recent emergence of Voice Assistants such as the Amazon Echo and the Google Home. As I was embarking on creating my own skills it became apparent that the information required to make a skill is not always at your fingertips. What started as a site enabling me to keep track of my progress and to be a repository of information has now started to morph into a site giving tutorials to prospective skill builders. 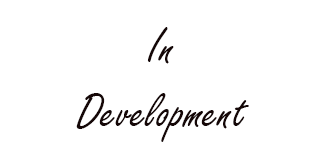 Over time the site will become a complete guide on how to create a skill using the myriad of technologies available. At present, there isn't a PHP SDK for the Alexa Skills Kit. The aim of this project is to fill this void and help reduce the overhead of creating skills for the Amazon Echo line of devices, enabling developers to concentrate on the features and functionality of their skill. The SDK is intended to utilise PHP and may also include functionality to enable the storage of session data and keep state when a user ends the skill abruptly allowing the interaction to continue later. All source code will be freely available on GitHub allowing further collaboration to help improve the SDK. Domain portfolio manager was a popular tool that I developed. The tool enabled domain owners to manage their collection effectively. The tool kept track of when domains expire and enabled the owner to group them together by the registrar or by category. The tool gave the user the ability to showcase their domains potentially opening up more opportunities for a sale. 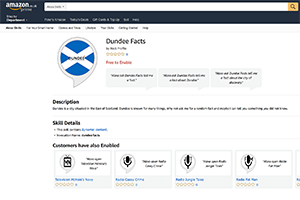 A simple Alexa skill utilising Node.js and the Alexa Skills Kit allowing users to retrieve a random fact for the Scottish city of Dundee. 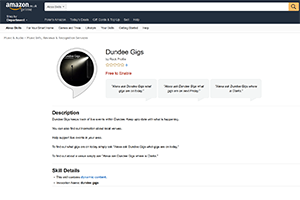 There are many reports of the demise of live music within Dundee, however, there are events happening on an almost daily basis. The aim of this skill was to enable anyone to be able to specify a day and find out what live events are happening then. The skill utilises a PHP script that calls to the ents24.com API. Moving forward there is scope to improve the skill by introducing features such as allowing the user to specify the genre of an event they are interested in or to follow certain artists and receive notifications if and when an event is scheduled. Politics shapes our daily lives yet few of us even know whom we are represented by in Holyrood. 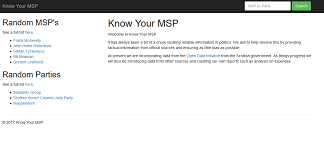 Know Your MSP aims in helping people identify whom they are represented by as well as what the MSP stands for. I had been thinking of creating an Alexa skill to accompany the website for some time. The perfect opportunity arose when Amazon partnered with Hackster.io. The entry gained second place in the competitions. 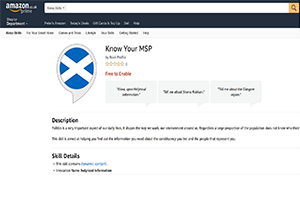 The skill enables users the ability to find out who represents them in the Scottish parliament. My own personal blog. This mainly focuses on programming and music. RockProfile.com is currently a work in progress. This had been on the back burner for a while, however, is now ramping up. The site itself has an aim of assisting artists to communicate directly with their fan base. To achieve this, I am developing the tools necessary for an artist to effectively manage, communicate with and engage the fans. As opposed to some of the other competitors in the marketplace the tools will be at the heart of the service rather than an addition to a service that already exists. 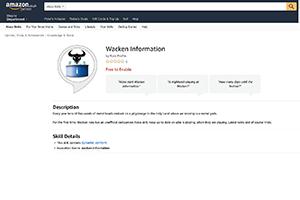 A simple Alexa skill utilising Node.js and the Alexa Skills Kit allowing users to retrieve a random fact for the Wacken music festival. Having visited the Wacken festival on numerous occasions I thought I would look into creating a skill that would help people keep up to date with the latest information about the festival as well as find out a bit about the past. At present, the skill is hosted on the AWS Lambda service utilising Node.js and the Amazon Skills Kit. The data is stored in JSON files within the lambda function, however, I am currently working on migrating this over to DynamoDB to enable ease of updates.